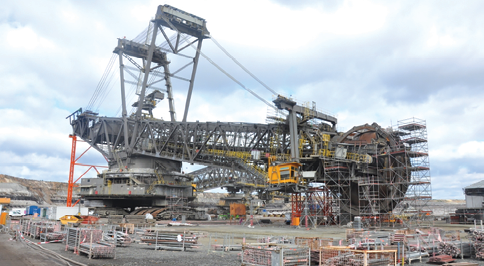 The bucketwheel excavators (BWEs) often used in surface mining of soft coal deposits are gigantic machines. With great size comes great punishment. BWEs must absorb a tremendous amount of impact shock and vibration during overburden stripping operations. Although they’re built to be extremely robust machines, the constant pounding takes its toll and repairs or replacement of parts inevitably becomes necessary. Again, along with great size comes great difficulty in planning, executing and safely, cost-effectively completing procedures on one or more of a BWE’s jumbo-sized components. Belzona, a manufacturer of industrial protective coatings and engineering composites, says its 7111 pourable chocking compound simplified and expedited repairs to this bucketwheel excavator’s turntable bearing assembly. 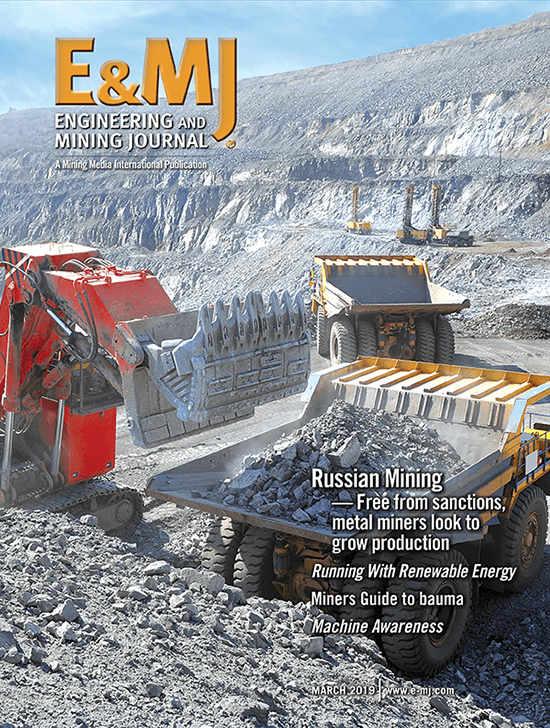 Late in the summer of 2015, a major mining company in Germany found itself facing a need to accurately locate and stabilize the bearing housing on a large BWE’s turntable in order to eliminate component movement and loss of machine efficiency. Measuring 17.4 m (57 ft) in diameter and 277 mm (11 in.) deep, the rotary turntable posed a considerable challenge for its owners to find a suitable stabilization (chocking) technology that would provide extremely high load-bearing capacity while enduring the continual physical stress of everyday operations. Having developed an existing business relationship with ITC, the Belzona distributorship in Germany, the customer determined that Belzona’s 7111 pourable chocking compound was the most suitable material to create a shim for the entire component. 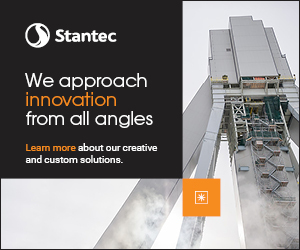 In addition to its capacity to absorb impact shock and vibration, 7111 has no need for heating or special application tools, making it a convenient and cost-effective solution to the problem. Due to the scale of the project, a detailed design was developed that spelled out how the work would progress. Belzona 7111 would be poured into 30 separate segments, above and below the bearing, in order to ensure equal coverage and level shimming. However, before the actual application began, a trial was conducted that allowed both the installers and client to identify and eliminate possible errors and optimize the application procedure. Casting experiments carried out in advance of the project indicated that the use of automatic mixers provided the best approach for minimizing undesirable air entrainment when mixing the compound. Belzona’s installation instructions, coupled with the experience gained from the casting trials, gave the applicators the opportunity to formulate a precise plan for mixing the product into batches for each segment. In order to completely secure the mammoth bearing in place, the application required a total of 251 units of Belzona 7111, totaling 1,750 kg (3,900 lb) of material. Work began in early September, with four days available in which to complete the project. In preparation, the metal substrate was cleaned and decontaminated of all residual dirt, oil and grease—a necessary step to avoid any contaminants mixing with the liquid Belzona 7111 and potentially creating curing issues. Another integral step in the application’s success involved measuring the temperature of the carbon steel. The substrate temperature determines the correct ratio of product solidifier to base during mixing. Once mixed, Belzona 7111 was poured in to a depth of up to 50 mm, allowing the mixture to flow under the turntable bearing and self-level. After the full curing period, the shim reportedly achieved 100% support of the bearing along with precise alignment. According to Belzona, the use of its 7111 chocking compound reduced repair labor costs for the customer, while minimizing service-accessibility issues due to its pourable consistency. The result: minimal BWE downtime plus a long-term shimming solution for the turntable bearing seat. The customer reported that following the shimming procedure, the excavator has performed effectively, standing up to the heavy stresses placed upon it during daily operation. The new Las Bambas copper mine in Peru is on track to become one of the world’s largest copper producers. 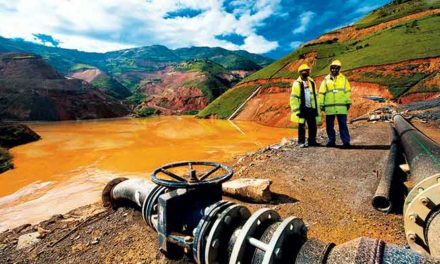 Ownership of the mine includes operator MMG (62.5%), a subsidiary of Guoxin International Investment Co. Ltd. (22.5%) and CITIC Metal Co. Ltd (15.0%). After shipping its first batch of copper concentrate early in 2016, it’s ramping up to reach a production rate of 400,000 mt/y in 2017. The mine’s concentates are delivered to the port of Matarani on the west coast of Peru via a unique fleet of specialized containers developed by Australia-based Intermodel Solutions Group, which received a tender from MMG in late 2014 for the supply of 1,200 of the containers to handle the mine’s product transport while avoiding a troublesome logistics problem. The problem was that the existing road gross weight limit was exceeded when using 8-m-long trailers and 12-m-long wagons loaded with two conventional concentrate containers. Loading just one container was unacceptable because that resulted in transporting less payload than allowed from the mine site to the rail head. The solution, conceived by engineering firm Ausenco, was to develop custom-sized containers suitable for tipper discharge, with sealable lids. The ISG-designed containers and lids used at Las Bambas measure 4 x 2.4 x 1.85 m and have a payload of 17.5 mt each. 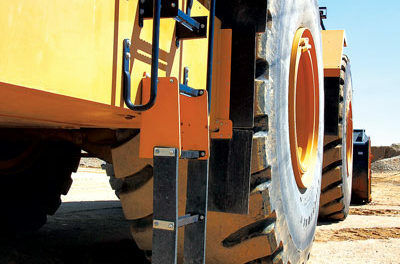 At the mine site, the containers’ lids are removed using custom-designed lid lifters furnished by ISG, and the containers are filled with concentrates by a wheel loader. Once loaded, their lids are replaced by the lid lifters and the containers are ready for a 420-km road haul to a rail transfer site at Pillones. At the transfer site, the containers are loaded onto special-purpose rail wagons for a 320-km journey to the port. The rail wagons each haul three 4-m containers. When the train arrives at the port, the containers are lifted directly from the wagons using a RAM Revolver container-rotating attachment mounted on a reach stacker. The Revolver employs another of the ISG patented lid lifters for unloading into a hopper for delivery to storage before shipment, or directly into a freighter’s cargo space if necessary. Custom-designed concentrate transport containers used at the Las Bambas mine carry 17.5 mt of product. Gravity Flow vs. Pumped Systems: Are You Overspending on Pipes and Pumps?